Like you, I heard all the stories of people getting robbed, pick-pocketed and scammed on their travels — especially to countries like Guatemala, which was first on my list of long-term backpacking travels. I wanted a way to keep my money and bank cards safe, especially from pick-pocketers- and that’s where the money belt comes in. Many travelers opt to use some version of a money belt – a belt, pouch or wallet worn under clothing that fits the essentials such as currency and a credit/debit card and, depending on the product’s size, your passport (this one is essential for me). I went for a standard money belt (waist wallet model) because of the fact that the under-the-clothes feature would at least help keep my money safe from sneaky, opportunistic thieves. Of course, there are many types of money belts on the market today, but I am going to take the time to talk about my personal experiences with the standard waist wallet money belt before exploring more secure alternatives. Yep, I still use a money belt when I travel, especially when I’m alone and have to make sure to keep tabs on all my stuff. “Stuff” is one thing, but your passport and credit cards is a whole different story. At least with a money belt, I know I have my most important travel gear on me at all times! I’ve used my money belt when traveling throughout Europe, in Guatemala and Mexico and through the Central Asian countries of Kyrgyzstan and Kazakhstan. I always make sure that in areas notorious for pickpockets, like trains and crowded undergrounds, I am prepared with money-belt usage. My tip: Grow comfortable with the positioning of items in your money belt. I keep my zipper just flush with the top of my pants so I can slyly unzip my belt and make it look like I am just adjusting my jeans or rubbing my stomach. I can then slip out an extra bill (one strategically placed for such circumstances) or credit card with ease by knowing where to look on the first try. Money, passports, plane tickets and credit cards can be on you AT ALL TIMES! Even when you’re sleeping on a train or plane, the money belt can stay fastened securely under your clothing, making loss from stealing or forgetfulness less likely. Pick-pockets and opportune thieves have a harder time stealing from them! It’s one thing for thieves to grab a wallet out of your pocket or open up a backpack, but to go underneath the clothes and into a zippered pouch? That takes skill. Many thieves know about your secret stash! Yes, unfortunately money belts are no secret in the travel world. This will not necessarily help you keep your valuables in a face-to-face robbery experience. The money belt can be bulky under the clothes! I found it works better when wearing jeans and layers on top (to hide the bulk). Summer skirts and tight clothing can make the money belt hard to conceal. They can get a little sweaty and smelly! Wearing something closely against your skin promotes sweating, which promotes a smell. You will need to occasionally wash your money belt, but it helps lessen the need if you choose an antimicrobial fabric option. *Submitted by Michele Herrmann originally as part of our One Little Thing interviews. I purchased one of Eagle Creek’s undercover belts, which slips under the hip portion of my pants with a strap to adjust its fit to my waist. This thin belt has two zipper pockets, so I can separate my cash in one place and my credit card and passport in the other. The price at the time was good, and I still use it twelve years later. While in Italy, I felt better having it on me. During a packed ferry ride to Venice, my tour group members and I huddled near to watch out for each other and our respective stuff. We heard later that supposedly a group of pickpockets cleaned out other passengers– most likely tourists– on the ferry. Hope that was just a rumor. As I continue to travel throughout Europe and the United States, my money belt has gone beyond serving as a security blanket. Storage: It’s held a room key during a night walk alone in Athens, near the Plaka. It’s been like a drawer for stomach medicine needed after a heavy BBQ meal in Memphis and ibuprofen for the morning after a strong cocktail and a nasty fall on Bourbon Street. Other contained items have ranged from hotel business cards (because it might take a while for me to remember the name of the place I’m staying), to handwritten notes. Money Management: Before venturing out, I try to take out how much I think I will need or spend that day or night. I leave the rest in. If I find I’m running short on dough, I find a bathroom or convenient corner where I can pull the belt out discreetly. Purse-free Travel: Gradually, my money belt has made me feel bold enough to leave my purse at the hotel, taking out the essentials, and walking around bag-free with confidence. If the idea of wearing something around your waist, under your shirt and/or pants, sounds annoying, there are several more styles of “money belts” to consider. Literally a money belt! Tuck bills into the belt and wear as usual. The downside? No room to stash cards or a passport. And many are rather plain. This one, however, seems to be designed with the female traveler in mind. >>Shop for a similar female money belt online. A cord/string is worn around the neck and the pouch (usually with a couple of zippered pockets and large enough for a passport) is worn under your shirt. The outline may be easily visible unless you are wearing a loose-fitting t-shirt, sweatshirt, or jacket. >>Shop for hidden neck pouches online. Worn on the forearm under a long sleeved shirt. This pouch will not be big enough to hold items like passports but can make for a good money and key stash when necessary. >>Shop for arm pouches online. A small pouch to conceal in your bra or that attaches to it. Good for cash and keys but not a passport. 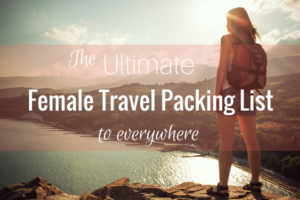 Read a couple travelers’ experiences with a bra stash here. >>Shop for bra pouches online. Worn around the calf above the ankle – best with long dresses or pants. >>Shop for leg wallets online. A small pouch/pocket with a couple of loops. If you wear a regular belt, feed the belt through the loops and wear the hidden pocket inside your shorts/pants. Some prefer to skip the belt and secure the pocket inside with a couple of safety pins. >>Shop for hidden pockets online. A strap is worn over the shoulder and the pouch is worn against your side under your arm (under clothing). >>Shop for shoulder holsters online. A bra pouch money belt option. Overall, I think money belts are a good idea in many travel situations. I love the peace of mind when riding in a crowded marshrutka in Bishkek or when lugging around all of my stuff from place to place. I know that my gear that actually solves real problems on the road (money, credit cards, passport) is on me, safe, at least as safe as it can be. Even cooler now are all the types of money belts on the market to choose from, like leg belts, arm bands and bra pouches. The standard money belt model works fine for me, but maybe you’d prefer a leg strap to hide your valuables. Just remember to not dip into your secret stash in public (it defeats the purpose!). Instead plan ahead and have what you truly need accessible, and then run to the bathroom or private place to get any extras. What are your thoughts on money belts? What do you use? P.S. You might be interested in these money belt alternatives: hidden pocket scarves, buddy pouch, and theft-proof clothing. I’m a big NO on moneybelts, having tried several times to use one. They’re too bulky, hot, and it’s way too difficult to discreetly and quickly remove cash or credit card. When in risky places I use a neck wallet and wear it cross-body over a tank top/under a shirt. It’s virtually invisible. The wallet is at my side seam where I can feel it with my upper arm and it can easily be pulled around to the front for access. I use the Pacsafe and Eagle Creek brands. Now there are RFID neck wallets, too.